A friend of mine recently asked on Facebook if anyone had a stamp or digi of an expectant mother with hubby holding her belly. There didn't seem many out there so I drew this one for her and decided to share it on my blog just in case anyone else is looking for the same. The original pen drawing is only about 3 1/2 inches high so I wouldn't advise enlarging it more than about 5" or it might look a bit strange. I hope someone out there can make use of it. Aloysius is up and about again and feeling much better, all he needs now to feel 100% is BIG hug from Molly to put the world to rights and of course Molly is only too happy to oblige. & the coloured version PDF HERE. After colouring the elements digitally I printed them off together and assembled them together using foampads on a round card. I cut a small piece from the bottom of the card to make it stand up. I lastly added Clear gloss to his nose, eyes and a little to his tongue to give them dimension. Card design - Vince Ballard. Backing paper - Amanda Marks. heshire Cat digi - Amanda Marks. Aloysius is a bit under the weather, Molly must have been feeding him too many sweets, as she does tend to spoil him! Still, he has hot soup and his favourite teddy so he should be feeling better very soon. 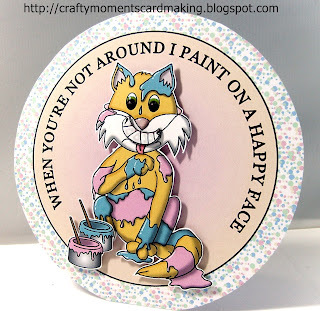 I thought this would make a cute (if not unusual) topper for a "Get well soon" card. This is a 5"x7" card I made using "PhotoScape" a free online photo editing software. One of it's features is "Make a box" filter, which I've used here to make the flat card look like a 3D box. 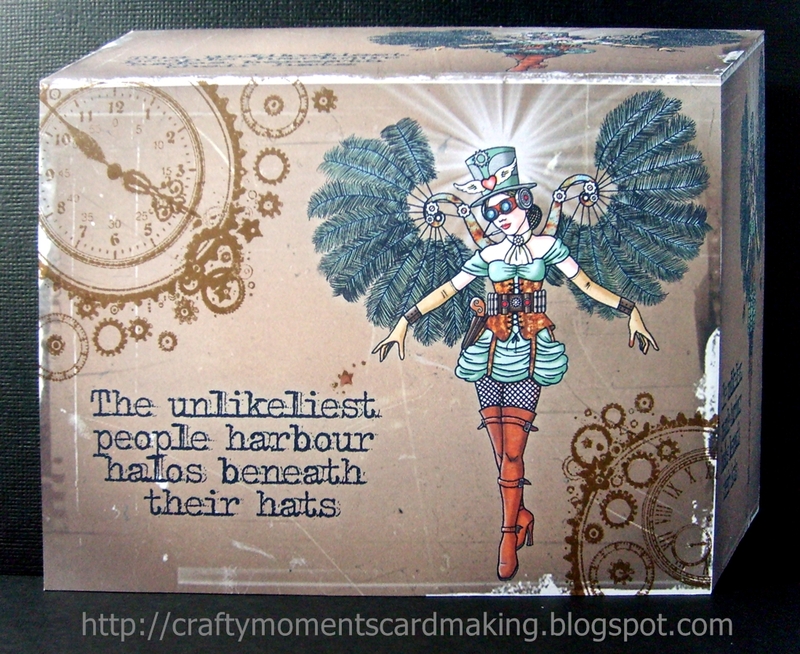 After designing and saving the picture (sentiment and Steampunk lady on a brown background) I opened it up in PhotoScape and used the "Make a box" filter. I then printed off and cut out the finished card and stamped it using HOTP's "Timeless" and "Masculine Collage" rubber stamps, I used Tim Holtz "Walnut Stain" distress ink as I didn't want a sharp outline. From afar it looks just like a real box yet it's flat! A cool Trompe L'Oeil effect. Who better to put on a Valentine's card than the Queen Of Hearts! This little lady is from Amanda's cute NEW "Alice In Wonderland" range of digi's, which also includes Alice, The Mad Hatter, The Cheshire Cat and the Caterpillar. 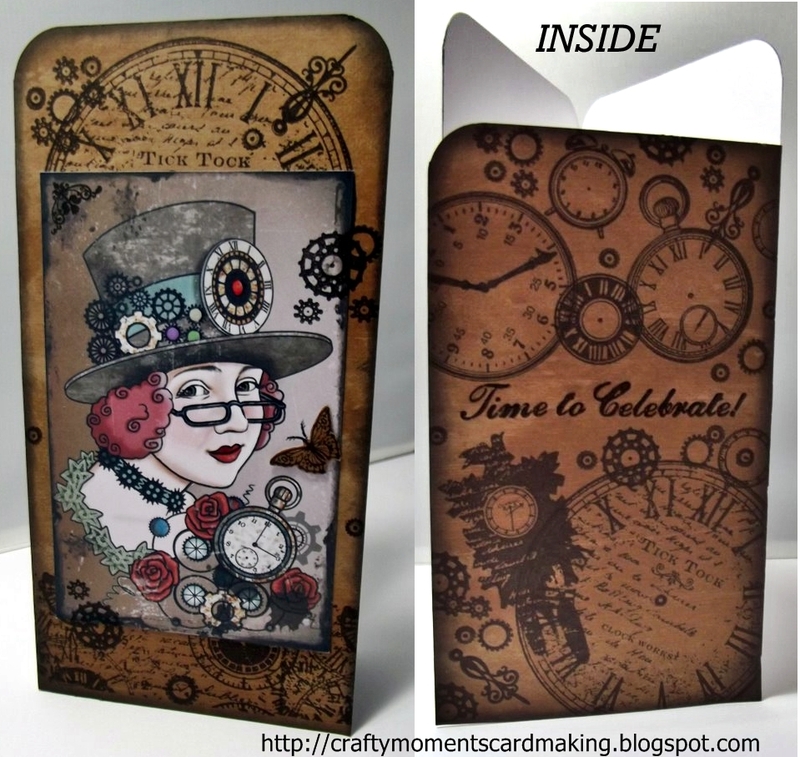 I used a 5"x7" white gate fold card, covered it with Amanda's "Alice In Wonderland" background paper, then went around the edge with an inkpad. Then I cut a large heart and again went around the edge with an inkpad before gluing it to the front of the card, the Queen was attached with foam pads and I used glossy accents on the heart head dress and her scepter. After adding some moving eyes and the heart shaped confetti around her head I finished it off with the sentiment. Inside the card I added a close up of the Queen and a pun about losing your head, that's what she famous for after all! Queen Digi - Amanda Marks. Maybe someone out there in Craftland can make use of him!? I'd love to see it if you do! The Steampunk girl picture is part of a set of Steampunk digi's I've been working on recently. Although you can't really tell fom this picture I've used glossy accents on her eyes, lips, glasses and a few of the coloured cogs to make them pop! I had an idea last month for a digi set, This is the first one and and thought I'd share with my "crafty" friends to see/use. Whilst out playing little Molly Mayhew found a baby dragon in an old tree stump, carried him home and spoilt him rotton. To her he was just like a big ol' puddy cat. Aloysius decided to stay, because although Molly could be boisterous with him sometimes, the rewards made it all worth while! No I'm not too late, nor too early, I drew this last year for Halloween, then over wrote the digi file with this coloured version by mistake - DOH!! So rather than just delete it altogether I've just finished colouring it and decided it might make a card topper or something that you clever crafter s might make use of.